THERE IS A GROWING interest in vintage caravanning. Baby boomers long to get back to the '60s, 40-somethings want to give their kids a laid back beachside holiday like they had when they were growing up, and heaps of people are getting into hot rods, custom cars and the rock-and-roll lifestyle, to create a kind of 1950s fantasy world. Vintage caravans are usually defined as anything pre-1970, and there are plenty of pitfalls to look out for when buying a caravan this old. We asked some vintage van owners what to watch out for when buying an old van. "I like to use the analogy of an iceberg when I explain to people about the potential problems with old vans. Only 10% of the iceberg is showing above the surface. The other 90% is hidden." Alan Collett of Bellambi, NSW has developed his iceberg theory after stripping down two bondwood caravans and an aluminium van. The problems that Alan encountered include rust in the chassis, and rotted timber framework. Alan says: "Look for rust in the chassis, particularly around the outside edge where it's covered by either bondwood or aluminium. Water leaking down the inside of the walls can end up getting caught between the chassis and the walls, and the chassis rusts away." Rotting timber in the framework is almost impossible to spot if it is hidden between the aluminium cladding and the interior panelling. Water damage can show as hairline cracks in the wall panelling, and Alan recommends drumming your fingers on the panelling to see if there appears to be any separation of the layers of the ply, or if the ply feels spongy when you press on it. Alan also watches out for silicone sealant that has been smeared over joints. "This stuff is a nightmare to remove," Alan says, "It requires hours and hours of painstaking work to remove completely." 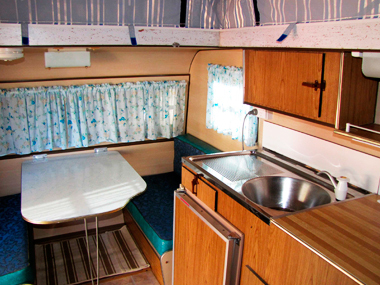 "Water damage and physical damage are the most likely problems you will find in a fibreglass vintage caravan." 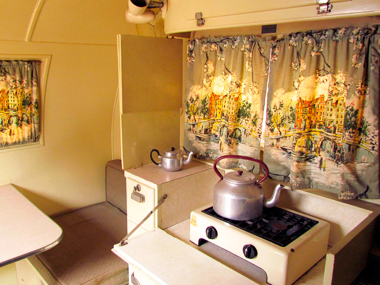 William Russell of Cairns, Qld owns a 1968 Olympic Riviera fibreglass caravan. Olympic and Sunliner all-fibreglass vans built in the 1960s are much sought after by vintage caravan enthusiasts. They are a popular choice for people who don't have any undercover storage for their caravan, because these models are extremely waterproof. Despite this, William warns that "a musty smell in a fibreglass caravan indicates leaks, which will come from joins, such as windows or holes, drilled to allow wires inside the van." In the case of fibreglass caravans, it is also relatively easy to spot damage to the exterior that has been repaired, as it will look different from the rest of the van. Make sure you take a careful look down the sides and across the front and back. "When inspecting a wooden caravan, check for wood rot and ensure that the caravan has been stored in a shed." Mark Taylor of Perth, WA has a large collection of wooden caravans from the 1940s and 1950s, all of which were in remarkably good original condition when he bought them. Mark likes to recreate the feeling of caravanning in the past, so he removes any modern additions, and often gives the interior and exterior a fresh coat of paint. Mark avoids damaged caravans that need a major restoration, unlike some other vintage caravan enthusiasts who are prepared to rebuild a caravan from the chassis up. Mark has been collecting vintage vans for more than a decade and his website, www.vintagecaravans.com, is a good starting point if you are looking to buy an old van. Other useful resources to keep an eye on include eBay and your local newspaper. "Registration requirements are different in different states, so make sure you check on these before you buy a caravan from interstate." 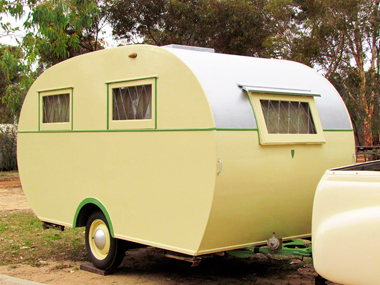 John and Judy Smyth of Ballarat, Vic purchased a vintage caravan from NSW, and got a bit of a shock when they later realised it didn't have brakes. 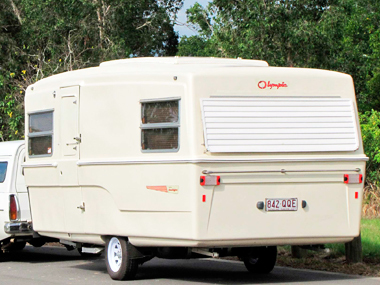 Apparently, in NSW, caravans up to a certain weight don't legally have to have brakes. It wasn't a simple job to rectify the problem either. The Smyths' caravan needed a new axle and wheels to enable brakes to be fitted before the van could be registered in Vic. 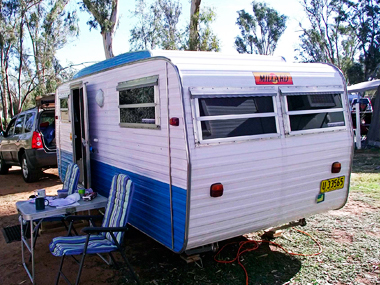 To satisfy legal requirements in certain states, and to ensure a safe caravan, owners may need to replace worn tyres, purchase a fire extinguisher and smoke alarm, and have all the electrical wiring and gas fittings checked. It pays to drive a hard bargain when buying a vintage caravan because inevitably there are going to be unseen problems. Indicator lights, fridge and interior lighting may not be working. Added to this, the cost of materials like paint, vinyl flooring, and new window seals that will be needed to restore the vehicle. That brings us to the final point to watch out for. Before you even set out to look for a vintage caravan, take a long hard look at your own DIY skills. Be realistic about what kind of project you are able to tackle and, where possible, ask for advice from those who have done it before.